Real Salt Lake's Jordan Allen, an Empire Revolution product, scored his first career MLS goal on Sunday. Allen's strike was an 89th minute winner against Toronto FC, and he has featured in all of RSL's three matches in 2015. SANDY, Utah – Real Salt Lake Head Coach Jeff Cassar needed players to step up on Sunday as RSL hosted Toronto FC while both clubs were missing key players to international absences and injuries. He got what he needed in earning a 2-1 victory on an 89th minute, game-winning goal from FW Jordan Allen. Real Salt Lake got goals from MF Luke Hulholland and Allen and two assists from MF Javier Morales as the club improved to 1-0-2 (5 points) with its first win of the season in front of a Rio Tinto Stadium-record crowd of 20,794. RSL outshot Toronto 6-3 in the first half, with FW Olmes Garcia taking four shots to lead the way, but he put just one on frame. In the 38th minute, RSL snatched the lead on Mulholland’s first goal of the season. Morales floated a ball to the back post from the left side and Mulholland went unmarked for a header to beat Toronto GK Joe Bendik for a 1-0 RSL lead. Moments later, FW Sebastian Jaime appeared to score his first goal for RSL, but was flagged offside on the play and the goal was disallowed and the 1-0 advantage held until halftime. GK Jeff Attinella was put to the test in the second half, coming up big on shots from MF Sebastian Giovinco and DF Nick Hagglund. In the 64th minute, Giovinco broke free on a ball from former RSL FW Robbie Findley and got a shot away heading toward the top left corner, but Attinella made the stop on the Italian playmaker. In the 71st minute, Hagglund got free in the box to get a shot off of a Giovinco free kick, but Attinella was there for the save. It wasn’t until the 88th minute that Toronto FC netted the equalizer. A pair of second-half substitutes combined as FW Bright Dike got the ball to MF Jackson Goncalves on a run into the box and Goncalves placed it past the oncoming Attinella to make it 1-1. Without missing a beat, Real Salt Lake responded one minute later when Morales played a ball in from the right side and found Allen for a header that hit the back of the net for his first career MLS goal and a 2-1 RSL victory. RSL’s next match will be on the road Sunday against the San Jose Earthquakes at Avaya Stadium. Kickoff for the nationally televised match on ESPN2 is scheduled for 3 p.m. MT. - Real Salt Lake and Toronto FC were both missing five players on international duty. RSL was without GK Nick Rimando (U.S.), DF Boyd Okwuonu (U.S. U-23s), MF Luis Gil (U.S. U-23s), DF Elias Vasquez (Guatemala) and FW Alvaro Saborio (Costa Rica). All five are expected to return after matches on Tuesday and ahead of Sunday’s match in San Jose. - RSL’s 38th minute goal was the club’s first from the run of play this season. The previous three goals came from a direct free kick, an indirect free kick and a penalty. - The sellout was Rio Tinto Stadium’s 18th consecutive full house. 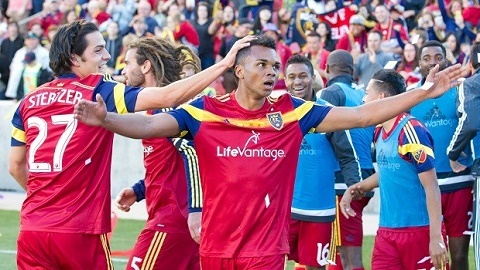 - The match was RSL’s first regular season Sunday home match in club history. - MF Sebastian Saucedo made his MLS debut when he subbed on for Olmes Garcia in stoppage time. Real Salt Lake (4-3-3): Jeff Attinella; Tony Beltran, Jamison Olave, Chris Schuler, Abdoulie Mansally; Kyle Beckerman (C), Luke Mulholland (John Stertzer – 78’), Javier Morales; Sebastian Jaime (Jordan Allen – 74’), Devon Sandoval, Olmes Garcia (Sebastian Saucedo – 91+). Substitutes not used: Lalo Fernandez, Aaron Maund, Phanuel Kavita, Pecka. Toronto FC (4-4-2): Joe Bendik; Ashtone Morgan (Daniel Lovitz – 77’), Nick Hagglund, Clement Simonin, Warren Creavalle (Jackson Goncalves – 67’); Collen Warner, Jonathan Osorio, Benoit Cheyrou (C), Sebastian Giovinco; Robbie Findley, Luke Moore (Bright Dike – 79’). Substitutes not used: Chris Konopka, Jordan Hamilton, Jay Chapman, Damien Perquis.